Black Lab with poodle hair. Looks like a Newfoundland to me, right at the age where they double in weight every month! Yup, He’s a Newfie. He is pooping enough that he should be doubling in weight every month or so. 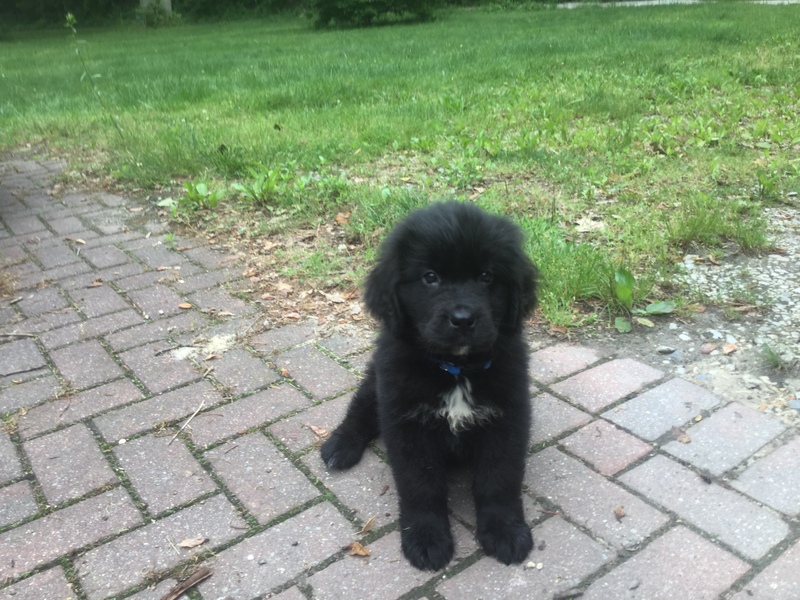 Name him “Seaman”, after the Newfoundland that accompanied the Lewis and Clark expedition. We already call my father-in-law that. Good suggestion tho! Just heard at the weekend about a friend’s dog called Askit. I had no idea that puppies had sharp little kitten teeth (they are hollow) till this infernal pooping machine bit all extremities multiple times. Give him ice cubes to chew on through out the day. It helps ease the teething pain. Buy some tennis balls, the extra-soft “training” ones. You could name him YA, as in : YA HERD !!!! A former classmate named her dog “Cooper”. She said, in retrospect, that she was glad she didn’t name it “Tucker”. Call him “Jackie Tramel” if it’s true that you survived Commodore. I was VP University Marketing there and managed the “Three for two” deal. Dealers gradually learned – – the third free computer was usually a broken one. How about Vic or Sid? Yeah I went through Greek names, Simarillion, finally looking at Flintstones…. Sadly I pronounce it Betel Guise (Rhythms with metal grease.) which is hard to yell at the top of your lungs at 2:00 AM when the dog is in the neighbor’s car trying to find the hot wire. My wife told me years ago that a single syllable name is good for a dog. I can bet you that, within a year or two, that cute white spot on her chest will disappear almost completly. My Newfoundland looked exactly the same and now I am the only one that can find the leftover 3 or 4 white hair where her white spot used to be. They’re the sweetest thing though, very patient and smart. They look like big, slow dum-dum half the time but when they are motivated (food/danger), they spring into action like a light switch. My big dummy surprised me a few time. We had two before this one and one didnt have much of a spot and one did. This one has little white chin hairs that it will be interseting to see if he keeps.